Two groundbreaking scientists stain cells, uncover the intricate secrets of the nervous system, and elevate scientific discovery to fine art. In 1872, Camillo Golgi accepted a job as the chief medical officer at the Hospital for the Chronically Sick at Abbiategrasso, Italy. It is here — ensconced in a tiny kitchen he had converted into a makeshift laboratory — that he created what he would call the “black reaction.” It was a method of staining that was able to capture even the most delicate of individual structures and would forever change the way scientists studied cells under microscopes. It also revealed for the first time what would later be named the neuron, with all its finger-like emanations, and laid bare the inner workings of the nervous system. His black reaction was created by hardening nervous tissue in potassium bichromate then slathering it with a solution of silver nitrate. The end result was a stain that randomly plucked a few cells and stained them black against a background of deep yellow. The fact that not every cell was stained allowed the technique to trace out delicate structures like dendrites that extended from the body of the nerve cells. Fourteen years later, Golgi’s revolutionary staining technique found its way to Spain to the laboratory of a colleague of anatomist Santiago Ramón y Cajal. Intrigued immediately, Cajal began using Golgi’s stain to support his idea that the nervous system was made up a web of distinct elements. The black reaction had revealed to Cajal the spaces between the tiny parts that made up the whole. The two shared a Nobel Prize in 1906. 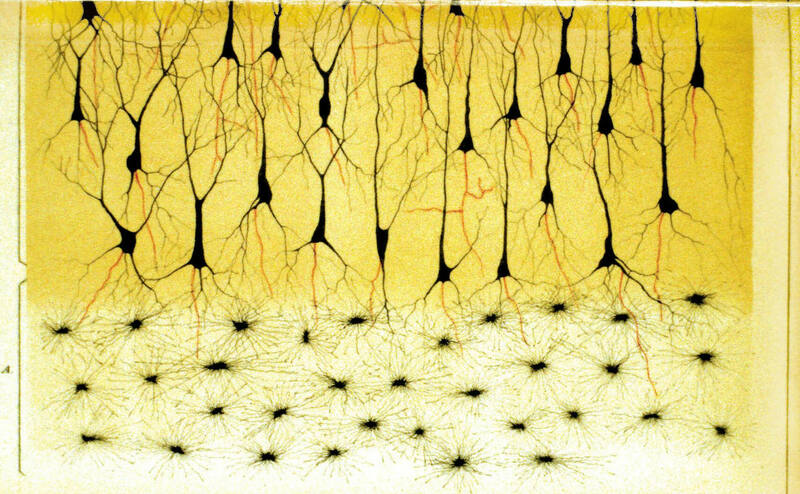 Golgi had devised a means to uncover the structure; Cajal had used it to reveal the way the structure worked. In the 1950s, the first synapses — the connections between two adjacent neurons — were first seen through the electron microscope. Today’s microscopes can capture entities far smaller than neurons, smaller than an atom even. Golgi and Cajal staining techniques continue to light the way.